uniLink-Trio is a complete multifunctional USB kit for most of your lifestyle gadgets. It comprises of three popular charge and sync tips which can be easily interchanged. 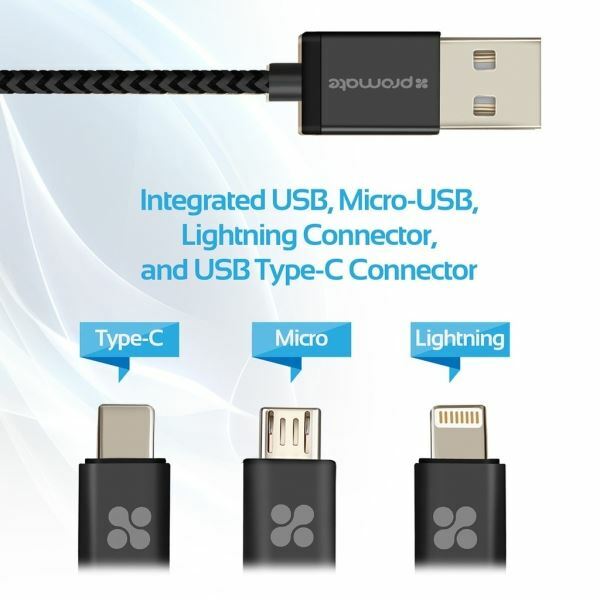 Use this kit for all your daily needs such as connecting to your smartphone, Lightning Connector or USB Type-C supported devices for a charge, quick data transfer, file sync and even more. uniLink-Trio is uniquely created from a durable flexShield material, promoting safe and protected operation. With uniLink-Trio, you can forget about all the cables you need to carry for your different devices. Trust uniLink-Trio for it all. • One cable to charge and sync all your devices. 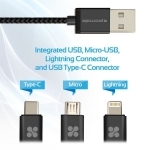 • Integrated USB, Micro-USB, Lightning Connector, and USB Type-C Connector. • Charges from any standard USB port. • Triple coated cable for stability and durability. • Made from plastic with shielded cable design.